Need a noticeable display for oversized graphics? These 36 x 48 poster floor stands will place advertisements and artwork in plain sight. Our catalog includes various models to meet any establishment's marketing needs. 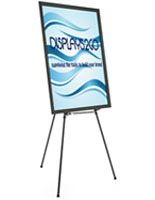 Our 36 x 48 poster floor stands are made for visibility, durability, and effortless use. 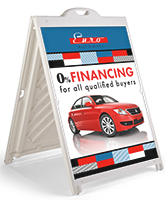 Large format frames are excellent for giving passersby the full picture about your business. In addition, each 36 x 48 poster floor stand is made for use in busy environments while presenting graphics with professionalism. The signage displays' construction makes adding and replacing advertisements a breeze as well. Browse our selection of graphic holders to find the right one for your goals. What types of 36 x 48 poster floor stands do we offer? 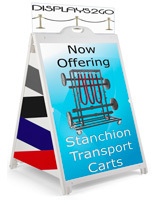 Our catalog includes sturdy sidewalk signs that are ideal for promotion outside retail stores and restaurants. 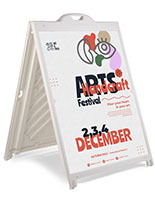 Each poster floor stand has a durable plastic A-frame design for outdoor advertising with a portrait graphic. These rugged frames are double sided to face both sides of traffic and each one has a fillable base to keep them rooted to the ground. While they can be weighted down for extra stability, these units also include wheels for relocating with ease. Maximize promotional space with our models that include a double sided header and triangle side panels. We also offer models that include your printed artwork on Coroplast boards. Just click on the "Customize it" button on any of these models to see what personalization options are available. 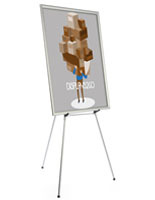 Our other line of 36x48 poster floor stands feature an easel design that's ideal for displaying art and making corporate presentations. These fixtures can exhibit both portrait and landscape images within their easy-open snap frame. This is also a great way to feature advertisements that are replaced often. The frames also include a clear PVC lens that protects artwork. 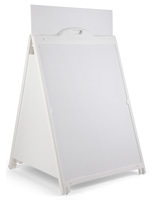 Each stand has an adjustable height and a removable clamp for accommodating flip charts. Our catalog on Displays2go.com features thousands of items that help businesses thrive. Order online for quick shipping and bulk pricing on all products!